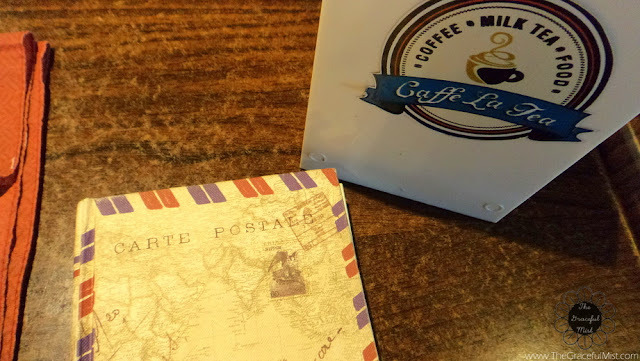 In this post, I`ll introduce you to Caffe La Tea, a cozy coffee, milk tea, and food stop with 10 branches in the country. Their store offers a great selection of food and drinks. Below are 3 out of 4 marked vegetarian foods they offer to serve. These Mojos are actually appetizers. They had a taste of authentic potato fries but I felt like there was too much onion-like taste to it. It tasted odd combined with the sauce. My friend commented that the sauce tasted like it has too much vinegar. I didn`t quite enjoy it. 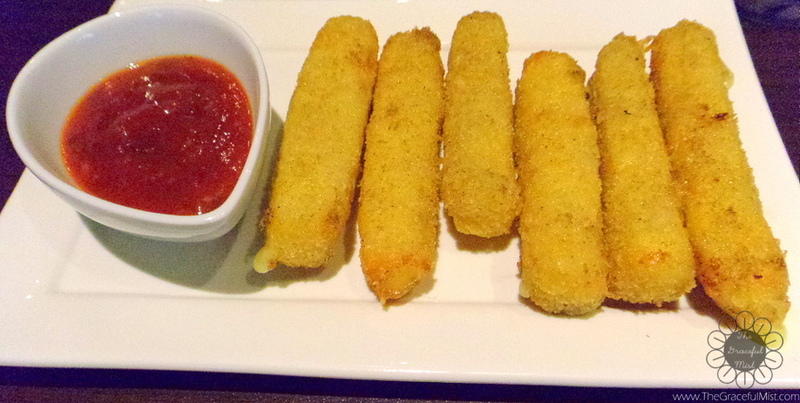 The Mozza Lava Sticks has a slight cheesy taste but it`s not much. It`s very filling. The sauce reminds me of spaghetti sauce. It`s an appetizer but I felt like after eating it, I was already full even though I shared it with my brother. Definitely share it with your family or friends or else you`ll be full before the actual meal. It`s "nakakasuya" (translation: distasteful because it`s "too much") in a way, so it`s a good thing I had their Milky Taro to sweeten things up. At the time, when I asked for the bill later on, it took them about 10-15 minutes before giving the bill because their printer somehow had problems. Wild Mushroom and Truffle Oil is basically like Carbonara. It has a bread at the side and has lots of sauce in the pasta. It was very delicious. I generally like pastas so I really liked this food. As for the price, I think it`s quite expensive considering there`s a carinderia outside my school selling Carbonara for only Php 30.00. The air-conditioned place and free Wi-Fi tried to make it up to me though! Regardless of the price, it`s my Vegetarian pick out of all the 3 Vegetarian foods I`ve had in their restaurant. "Deviled Tofu", another food which was marked as "Vegetarian" in their menu, is tofu with lots of chili. I didn`t try it mainly because I generally don`t find spicy foods delightful. I opted out of eating this one since I had a huge feeling I won`t enjoy it much because as stated in their menu, it has "lots of chilis". They didn`t have a lot of vegetarian foods to pick from and most of them are appetizers. The "Deviled Tofu" has lots of chili so that`s out of the options for me. That left me with only the Wild Mushroom and Truffle Oil, my vegetarian pick. Caffe La Tea in Anonas has outdoor tables and chairs for customers and there are two floors inside. It had good air-conditioning and free Wi-Fi. They had quite a lot of waitresses and waiters to serve customers. It`s quite noisy outside the store because of passing jeepneys, tricycles and other vehicles, business establishments going by their day-to-day tasks, and chatters of passersby as it is located in a very populated area in Anonas. Directly from the door, the cashier counter and comfort rooms can be seen. The comfort rooms have sliding doors so I really have to close the door tight. Inside the first floor, there are about 2 available tables and cushioned seats facing another counter. Upstairs, there are seats available for 1 person up to a group of about 10. During my visits, they usually play relaxing music but it can be quite noisy at the second floor since they usually have a lot of customers. I wouldn`t recommend it as a place to study or do work because there could be loud chatters and the pressure to leave immediately since they have many customers during lunch, merienda and dinner. Their customer service was alright. The employees were welcoming and nice. They also played a birthday song and sung quite a few times for some customers` birthdays. Sometimes I get my order quite fast and sometimes it takes more time but it usually took them quite some time giving the bill and/or change. Wild Mushroom and Truffle Oil which was my vegetarian pick tasted delicious but it was not easy in the pockets for a student`s casual dining. The rest of the vegetarian foods had flavors of their own and may not appeal to each customer`s taste preference. All in all, Caffe La Tea was a nice place to eat at but it`s not recommendable for strict vegetarians because of the limited options. 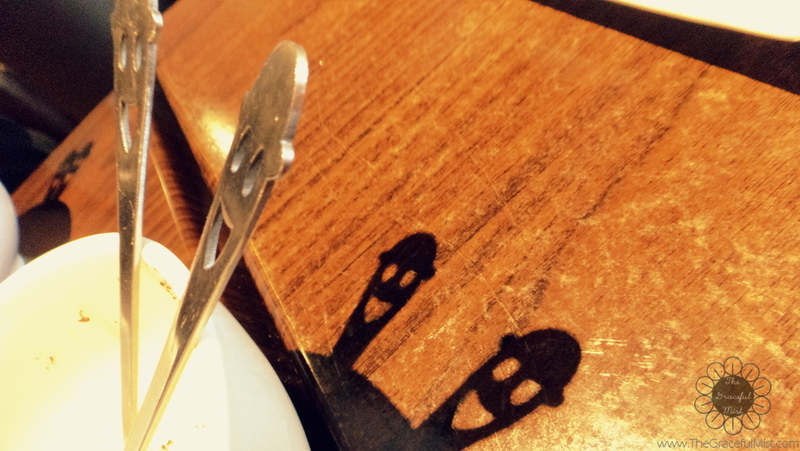 Reminder: Stores of Caffe La Tea may vary in design, location, menu, and arrangement for the different branches. It is. Thank you for reading. Ooh I love mojo's they are delicious and are perfect with aoili. The pasta looks good too! The pasta was delicious. Thank you for reading. Oh, that's definitely my kind of place! The food looks good - I would choose Mojos right now! 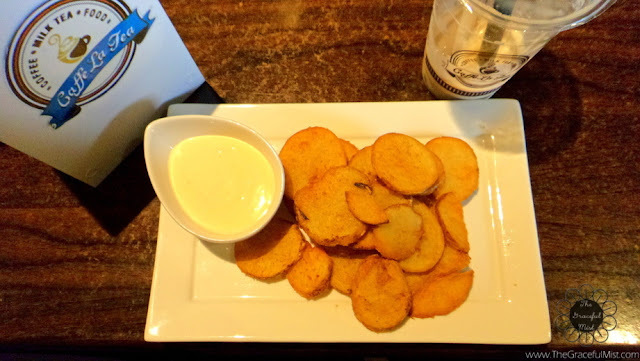 I love aioli and those chips look so delicious! All the dishes look delicious! I wish I could try them. If I ever visit your country, I will definitely visit one of these restaurants. Thank you! I think it`s worth dropping by this restaurant. Thank you for reading. I'd probably try a few of their vegetarian options. Their deviled tofu actually sounds pretty good to me. I think I could eat way too many of those Mozza Lava sticks. They look delish! Let me know if you have any questions. Thank you for reading. I loved hearing what you thought about this place in an honest review. These are the types of reviews that actually make a difference on whether I will go to them or not! 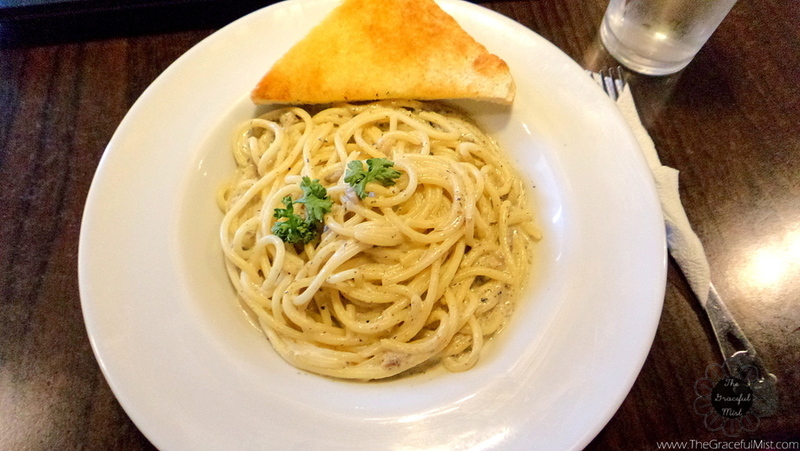 The wild mushroom and truffle oil pasta would definitely be my pick and it looks delicious! It's a shame the other options weren't to your liking as much! Oh my, you are making me hungry!!! I am drooling over here. Wild mushroom and truffle oil is a deadly combo in any dish, yumm!! The pasta looked delicious. I love truffle oil so this was definitely up my alley. I'd actually love a bowl of that with a slice of bread right now. The mushroom pasta looks so good! I love pasta so much so will have to give this one a try. I would love to try their tofu, that's one of my fave meals, be it steamed, deep fried or sauted. I would love to try mojos too, since you described it to have onion like taste and one of my fave is I onion rings. The food looks delicious. I love anything like that and often make it at home too. Fried things may be unhealthy but they are yummy. This looks delicious! The pictures made me hungry... This sounds like an interesting place. Sounds like a yummy place to visit. Their food looks to die for. I bet it melts in your mouth.